The principles of war were not established in a training regulation until 1921. 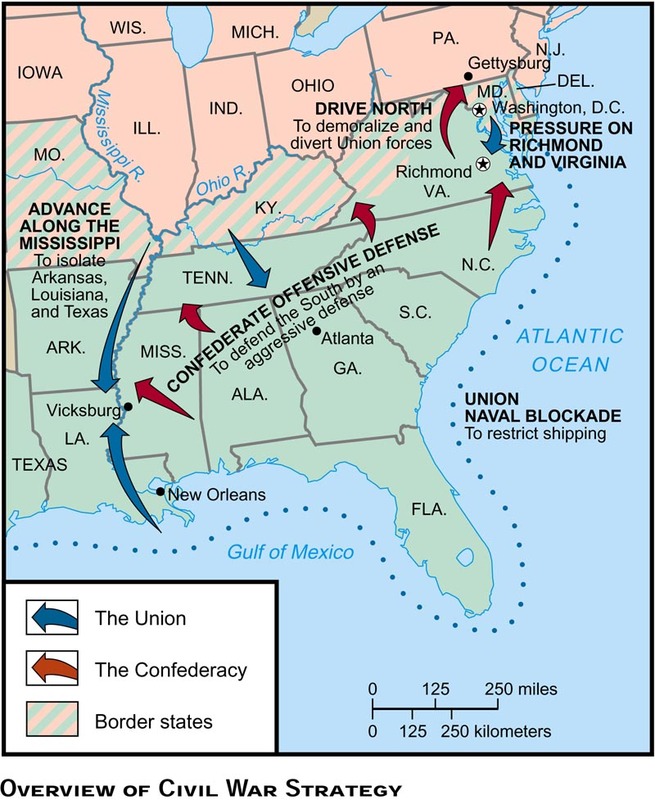 However, many of the concepts of present-day army warfare were developed during the Civil War. Most senior Union and Confederate commanders were graduates of the United States Military Academy at West Point, New York. They were well versed in the art of war, as then practiced. Technological innovations, such as the rifled-musket, required changes in tactics to meet the new situations. Dogmatic commanders tended to be replaced by those able to adapt to field conditions during the latter years of the war. Those present during the final stages of the Civil War had learned their lessons well, but tired, saddle-weary, rain-soaked, combat-hardened veterans did make mistakes during battle. These mistakes were paid for by their soldiers. The lessons of the final engagements of the conflict, relative to the principles of war, require a careful assessment of the movements of the commands, deployment of troops, offensive action, defensive action, unit cohesion, and unit disintegration. By studying the Civil War, the U.S. Army has learned invaluable lessons. Whenever Army forces are called to fight, they fight to win. Army forces in combat seek to impose their will on the enemy. Victory is the objective, no matter what the mission. Nothing short of victory is acceptable. The fundamental tenets of Army operations doctrine describe the characteristics of successful operations. In and of themselves they do not guarantee victory, but their absence makes winning difficult and costly to achieve. The ability to set or to change the terms of battle. In the attack, initiative implies never allowing the enemy to recover from the initial shock of the attack. In the defense, initiative implies quickly turning the tables on the attacker. In battle, initiative requires the decentralization of decision authority to the lowest practical level. The ability of friendly forces to react faster than the enemy. A mental and physical quality, it is a prerequisite for seizing and holding the initiative. The accumulation of chance errors, unexpected difficulties, and confusion of battle creates friction that impedes both sides. The extension of operations in time, space, resources, and purpose. Operations are conducted throughout the depth of the battlefield with the aim of defeating the enemy more rapidly by denying freedom of action and disrupting or destroying the coherence and tempo of its operations. The ability to focus resources and activities in time and space to provide maximum relative combat power at the decisive point. The ability of units to meet diverse challenges, shift focus, tailor forces, and move from one role or mission to another rapidly and efficiently. Four primary elements combine to create combat power - the ability to fight. The movement of combat forces to gain positional advantage, usually in order to deliver either direct or indirect fire upon the enemy. Maneuver is the means of positioning forces at decisive points to achieve surprise, psychological shock, physical momentum, massed effects, and moral dominance. The destructive force essential to defeating the enemy's ability and will to fight. It is the amount of fire that may be delivered by a position, unit, or weapon system. Conserving the fighting potential of a force so that commanders can apply it at the decisive time and place. Protection has four components: operational security, conservation of soldiers' health, morale, and equipment readiness, safety, and avoidance of fratricide. The most essential dynamic of combat power is competent and confident leadership of officers and noncommissioned officers. Direct every military operation toward a clearly defined, decisive, attainable objective. The ultimate military purpose of war is the destruction of the enemy armed forces and the enemy's will to fight. Seize, retain, and exploit the initiative. Offensive action is the most effective and decisive way to attain a clearly defined common objective. Offensive operations are the means by which a military force seizes and holds the initiative while maintaining freedom of action and achieving decisive results. Mass the effects of overwhelming combat power at the decisive place and time. To mass is to hit the enemy with a closed fist, not poke at him with the fingers of an open hand. Mass seeks to smash the enemy, not sting him. Economy of force is the judicious employment and distribution of forces. No part of the force should ever be left without purpose. Place the enemy in a position of disadvantage through flexible application of combat power. For every objective, seek unity of command and unity of effort. Unity of command means that all forces are under one responsible commander. Never permit the enemy to acquire unexpected advantage. Security enhances freedom of action by reducing vulnerability to hostile acts, influence, or surprise. Security results from the measures taken by a commander to protect his forces. Strike the enemy at a time or place or in a manner for which he is unprepared. Surprise can decisively shift the balance of combat power. Prepare clear, uncomplicated plans and concise orders to ensure thorough understanding. Everything in war is very simple, but the simple thing is difficult. References: Center of Military History, United States Army, Washington, D.C.; Field Manual (FM) 100–5. 1993 Operations, U.S. Army, June 1993. This translation keeps the package tight, with crisp language and short sections. Commentaries from the Chinese tradition trail Sun Tzu's words, elaborating and picking up on puzzling lines. Take the solitary passage: "Do not eat food for their soldiers." Elsewhere, Sun Tzu has told us to plunder the enemy's stores, but now we're not supposed to eat the food? The Tang dynasty commentator Du Mu solves the puzzle nicely, "If the enemy suddenly abandons their food supplies, they should be tested first before eating, lest they be poisoned." Most passages, however, are the pinnacle of succinct clarity: "Lure them in with the prospect of gain, take them by confusion" or "Invincibility is in oneself, vulnerability is in the opponent." Sun Tzu's maxims are widely applicable beyond the military because they speak directly to the exigencies of survival. Your new tools will serve you well, but don't flaunt them. Remember Sun Tzu's advice: "Though effective, appear to be ineffective." The Art of War is a book which should be used to gain advantage of opponents in the boardroom and battlefield alike. About the Author: Paddy Griffith, formerly a senior lecturer in war studies at the Royal Military Academy at Sandhurst, England, is the author of several other books on military subjects, including Battle Tactics of the Western Front: The British Army's Art of Attack, published by Yale University Press. The chronological collection draws upon the expertise of noted historians, military authorities, engineers, and war correspondents to convey the personal side of conflict not often found in history books. A trove of archival footage and documents brings viewers closer than ever to the heated heart of combat. This is truly a one-of-a-kind collector's set! Recommended Reading: The 1863 U.S. Infantry Tactics: Infantry of the Line, Light Infantry, and Riflemen (Hardcover: 608 pages). Description: Written in 1861 at the direction of the War Department and copiously illustrated, this was the book used to train, lead, and maneuver U.S. Infantry units on Civil War battlefields. It contains the school of the soldier, the company, and battalion or fielded regiment, along with all-important instructions for skirmishers. More than 15 pages of field music, the articles of war in use at the time, and a dictionary of Civil War military terminology complete this extensive work. The work was authorized and adopted by the Secretary of War on May 1, 1861. This is the second edition issued in 1863.